On his twenty first birthday, Tim (Domhnall Gleeson – Harry Potter) is told a family secret by his father (Bill Nighy – Love Actually). All of the men in their family can actually travel back in time. There are rules to adhere to but ultimately, Tim can now travel within his own lifetime to change anything he wants. But he must use this gift to make his life and those around him better. So he does what every young man would do in his place – he tries to get a girlfriend. But Tim soon learns that time travel may have repercussions that could jeopardise a truly special relationship he has started with an American girl named Mary (Rachel McAdams – The Notebook). About Time is a moving and unabashed romantic comedy that perfectly encapsulates the highs and lows of relationships and family life. Surprisingly, the time-travel element works a treat here and gives the film a depth that is well-explored and never gimmicky. Don’t worry too much about the science of About Time; this isn’t what you should be focussing on. It’s a story about love, loss, second chances and missed opportunities. We’ve all wanted to go back in our life to change something and this lets us vicariously do that. Domhnall Gleeson (son of legendary screen actor Brendan) gives us a hero to champion. His everyman charm wins you over instantly and he handles the astute comedy exceptionally well. Like Hugh Grant before him, Gleeson treads that affable line well and always holds your attention. 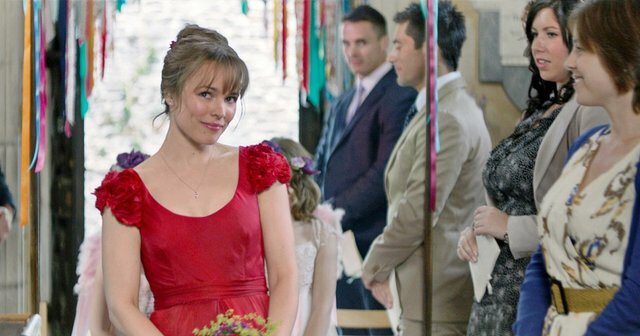 If that wasn’t enough, the gorgeous Rachel McAdams is perfectly cast as his love interest. The American actress feels perfectly at home here and excels at the comedy as well as being a love interest you’ll also fall head over heels for. Both Gleeson and McAdams make a wonderful onscreen couple and are a huge reason why About Time works so well. However, this is just as much a film about the father-son dynamic as it is about boy meets girl. Having Bill Nighy play the father was a masterstroke as he’s just so naturally warm and welcoming onscreen. The dynamic between Gleeson and Nighy always feels genuine and sincere and is the strongest element of this story. It perfectly encapsulates the journey we take with our own parents, along with the smiles and sadness associated with love and loss. Elsewhere, there are plenty of memorable supporting characters to enjoy. Richard Cordery is wonderful as the eccentric but sweet natured Uncle of the family, Tom Hollander plays a grouchy playwright (what’s Curtis trying to tell us here?) and the late Richard Griffiths shines in a funny cameo role. If Rachel McAdams wasn’t enough, there are two more reason to fall in love when Margot Robbie shows up as Tim’s first crush. Robbie is currently enjoying a huge profile lift after her revealing role in The Wolf Of Wall Street. The scene where she asks Tim to rub sun-cream on her back is truly hilarious. Lydia Wilson is perfectly cast as Tim’s sister Kit-Kat and plays the kooky-charm card to perfection too. Richard Curtis has announced that this will be the last movie he directs and that’s a crying shame for a lot of reasons. No one does what he does – he cultivates a warm and truly special atmosphere in all of his stories that strike a personal chord with their audience. From his stellar TV work including such gems as Blackadder and The Vicar of Dibley, to his peerless rom-coms Love Actually, Four Weddings and a Funeral and Notting Hill, Curtis knows how to tell a story in an enduring and relatable way. He also knows how to shoot London to find its magic – something that will now be sorely missed. Mirroring the themes he so eloquently addresses in the movie, Curtis perhaps deems this to be the right time to bow out and focus on his family life. For that, no one can begrudge him. But it’s a real shame given his talent for writing and directing and the impact his movies still make. His films enchant and endure and for that we’ll always be grateful. They may not win big at awards ceremonies but his projects have mastered that very hard task of entertaining from the heart. As a film-lover, I will miss how his stories affect me. About Time features a plethora of stunning, idyllic locations. London is, of course, well represented but it’s the family home in Cornwall that really sets the heart aflutter. This beautifully picturesque landscape lends the film a warmth and sense of togetherness that permeates through to the script and performances. Again, Richard Curtis knows exactly how to use his environment to its maximum potential and leaves us with a romantic picture-postcard in our mind long after the credits roll. About Time is an utter joy from start to finish. It goes without saying that if you are a fan of Curtis’ work you’ll fall instantly in love with this bittersweet and poignant tale. With amazing performances, beautiful locations and a clever yet moving script, About Time is the perfect date movie, a near-perfect rom-com and a film that will have you laughing and sobbing in equal measure. All that’s left to do now is to find a dark corner and try to go back in time – if just to convince Richard Curtis not to retire just yet.